W&L Hosts 13th National Symposium of Theater and Performance Arts in Academe Highlights include live performances, including “Exile is My Home” by W&L professor Domnica Radulescu. “Exile is My Home,” 2016 NYC production. Washington and Lee University will welcome visitors from around the world to its 13th National Symposium of Theater and Performance Arts in Academe on March 30. This year’s symposium, “Home, Borders and the Immigrant Experience in Theater and the Performing Arts,” was organized by Domnica Radulescu, founding director of the symposium and the Edwin A. Morris Professor of Comparative Literature at W&L. “This year’s symposium is particularly important and relevant given the current issues of immigration, as it addresses precisely how theater, film and the performing arts are responding to such urgent problems of our time,” said Radulescu. The conference will feature live performances and lectures, including a pared-down version of Radulescu’s play “Exile is My Home: A Sci-fi Immigrant Fairy Tale.” The award-winning production appeared on the New York stage off, off Broadway last spring. All events will take place in the Stackhouse Theater in Elrod Commons and are free and open to the public. Welcoming address: Marc Connor, Jo M. and James Ballengee Professor of English and provost of W&L. Opening remarks: Domnica Radulescu, the Edwin A. Morris Professor of Comparative Literature. “Rhinoceros” and “Ficelle.” Short scenes by Eugene Ionesco and Matei Visniec, performed by students in French 342. “African Migration in the Mind of Italy: ‘Noise in the Waters.’ ” Tom Simpson, associate professor of Italian, Northwestern University. The presentation discusses the 2010 Italian play “Rumore di acque” (“Noise in the Waters”), which dramatizes not only the ongoing tragedy of those who die at sea in the attempt to cross the Mediterranean from the shores of Africa into Italy, but also the grotesque ways people in the ex-colonial powers rationalize and normalize their own culpability. “New Romanian Cinema: Crossing National Borders Through Irony and Reflexivity.” Dominique Nasta, professor of film studies, Université Libre de Bruxelles. A bright spot on the map of world cinema, Romania somehow unexpectedly produced one of the few coherent New Waves, having garnered important international recognition during the last 10 years. Essential films by Cristian Mungiu, Corneliu Porumboiu, Cristi Puiu or Radu Muntean set forth a new way of confronting historical or ideological facts and moral dilemmas and led to a rhetorical reshaping of the grammar of cinema. “Re-performed Traditions and the Immigrant Experience: The Indian Theater of Roots in the United States.” Sabina Maria Draga Alexandru, associate professor of American studies, University of Bucharest. 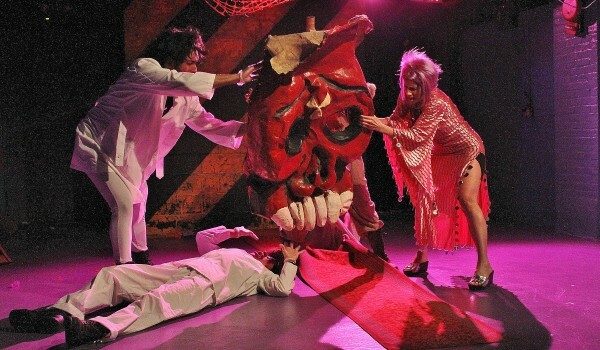 The talk will examine some of the uses of the aesthetics of traditional Indian theater, derived from the Natya Sastra and adapted to the requirements of modern times, in stagings of theater of roots plays in the U.S. for the benefit of U.S.-located South Asian communities. “Precarious Temporalities: Neoliberalism, Sexual Citizenship and the Global Deportation Regime.” Rachel Lewis, assistant professor in the Women and Gender Studies Program, George Mason University. Lewis will discuss how feminist and queer refugee narratives across a variety of media platforms, including photography, painting and performance art, recast migrant precarity as a question of temporality, along with the ways in which immigrant re-appropriations of temporality through performance can facilitate refugee healing and resistance. “Vulnerable Bodies in Transformation.” A selection of readings from the performance series, “The Goddess Diaries.” Carol Campbell, George Mason University. Campbell will discusses the theoretical framework around gender issues and perform selections from her work that includes true stories of fiercely courageous women. “Exile Is My Home: A Sci-fi Immigrant Fairy Tale.” By Domnica Radulescu. Directed by Andreas Robertz. Performed by Nikaury Rodriguez, Florinda Ruiz, Mirandy Rodriguez, Mario Golden, A.B. Lugo, Vivienne Jurado and David van Leesteen. Music composed by Alexander Tanson. 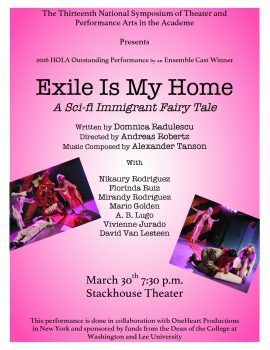 “Exile Is My Home” won the 2016 HOLA Outstanding Performance by an Ensemble Cast Award. This performance is in collaboration with OneHeart Productions in New York City and is supported with funds from the dean of the College at Washington and Lee University. The Symposium has been supported by funds from the Office of the Dean of the College, by the Center for Global Learning and the Mellon Foundation as part of the “Borders and Their Human Impact” series. Generous funding was also provided by the Glasgow Endowment for the Arts and the Women’s Gender and Sexuality Studies at Washington and Lee University. Billed as a “sci-fi immigrant tale,” “Exile is My Home” is the story of Mina and Lina, a refugee couple from the Balkans traveling through the galaxy in search of a planet to call home. “The play combines absurdist comedy, irony and suspense to raise consciousness about the current international refugee crisis and the complexity of issues related to it,” said playwright Domnica Radulescu. For the March 30 staging, the play will feature all but one member of the original cast, whose role will be filled by Florinda Ruiz, visiting associate professor of writing at W&L. In addition, the production will feature the original music and will include video clips from the New York City production. You can read an interview with Radulescu on the New York Theater Review website. Radulescu, who has written, edited or co-authored 13 books, has also written and directed numerous plays. A full production of “Naturalized Woman: A Quilting, Surrealist Project about Immigrant Women” was staged for the first time at the Thespis Theater Festival, off off Broadway, in New York City, in 2012. Her plays “The Town with Very Nice People” and “Exile Is My Home” received second prize (2013) and, respectively, Honorable Mention (2014) from the Jane Chambers Playwriting Competition. Radulescu directed both “4:48. Psychosis” by Sarah Kane and “Nine Parts of Desire” by Heather Raffo at Cluj National Theater, Romania, in 2008. Radulescu joined the W&L faculty in 1992. In addition to teaching courses in French language and literature and in Italian Renaissance literature, she is the co-founder of W&L’s Women’s Gender and Sexuality Studies Program. She received the 2011 Outstanding Faculty Award from the State Council of Higher Education for Virginia.